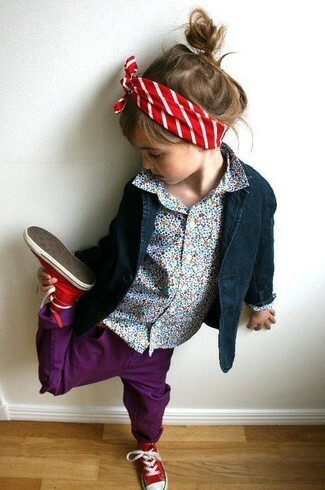 Suggest that your little one team a pink ruffle long sleeve t-shirt with dark green leggings for a comfy outfit. 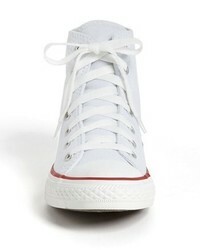 Converse chuck taylor high top sneaker are a smart choice to complement this style. 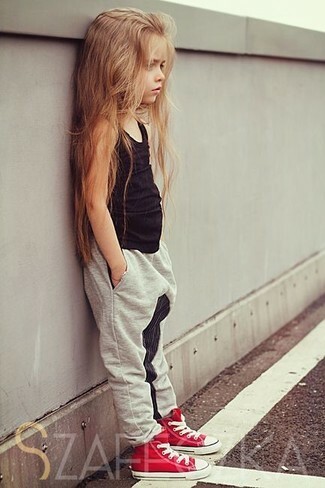 Suggest that your little girl pair a white tank top with charcoal leggings for a fun day in the park. Converse chuck taylor high top sneaker are a wonderful choice to complement this outfit. Suggest that your little fashionista dress in a white t-shirt and light blue denim shorts for a laid-back yet fashion-forward outfit. 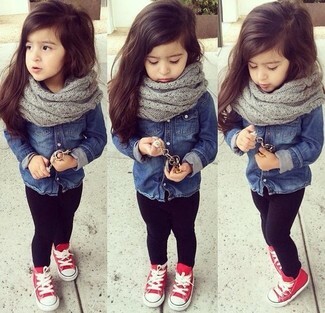 As for footwear your darling will love red sneakers for this outfit. For an everyday outfit that is full of character and personality suggest that your darling choose a navy blazer and purple jeans. 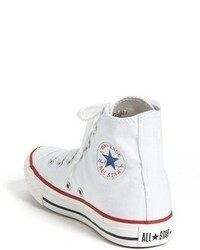 Converse chuck taylor high top sneaker from Nordstrom are a great choice to round off this look. This combo of a navy denim long sleeve shirt and black leggings will enable you to keep your little angel's' style clean and simple. 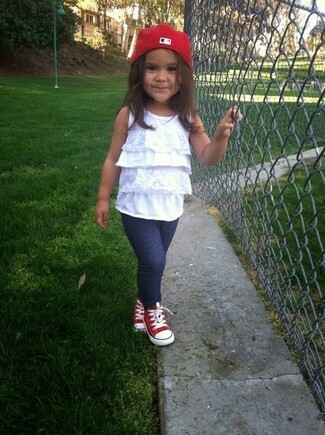 This outfit is complemented nicely with Converse chuck taylor high top sneaker. 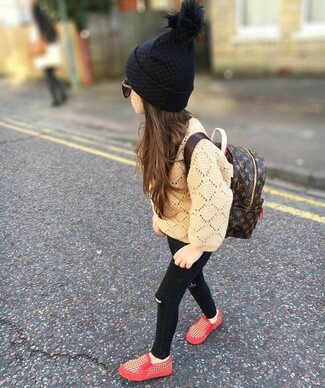 Suggest that your daughter go for a tan sweater and black jeans for a trendy and easy going look. Red sneakers are a great choice to round off this getup. Consider dressing your girl in a black tank top with grey trousers for a fun day out at the playground. 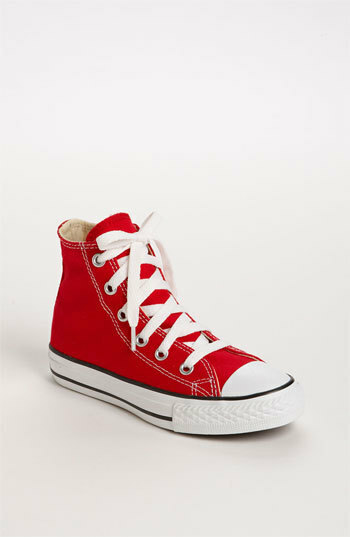 Converse chuck taylor high top sneaker from Nordstrom are a smart choice to complement this ensemble. 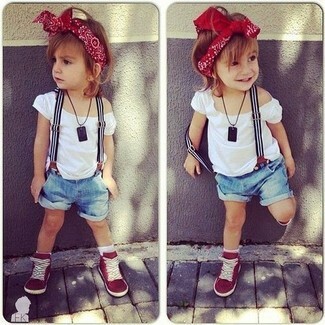 Suggest that your child opt for a grey t-shirt and blue denim shorts for a fun day out at the playground. 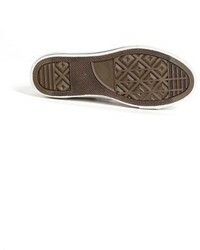 Converse chuck taylor high top sneaker from Nordstrom are a smart choice to complement this getup. You'll have no problem tempting your darling into wearing this combo of a red jacket and navy jeans. This getup is complemented nicely with Converse chuck taylor high top sneaker.